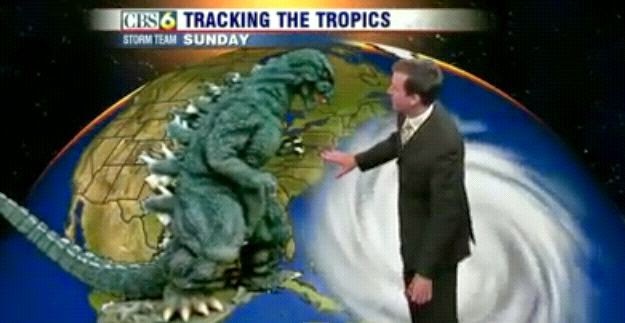 Kaiju News | Everything Kaiju: Weatherman Predicts Godzilla Attack for Virginia on Wednesday. True Story. Weatherman Predicts Godzilla Attack for Virginia on Wednesday. True Story. On WTVR CBS 6 in Richmond, VA, weatherman Aaron Justus provides the last weather forecast you'll ever need. This is the greatest Weather forecast ever! It starts with a Volcano eruption on Monday, hot enough to create temperatures up to 400 degrees, then a super storm on Tuesday that will thankfully be repelled by a Godzilla attack on Wednesday. Please watch the weatherman's forecast below.